VoiceMap is a publishing platform for audio tours. Our apps for iOS and Android use GPS to play audio automatically, at exactly the right time and place. The tours work offline, with offline maps, to accommodate users without access to mobile data. To find out more about creating an immersive audio walk, cycle or drive for your business, or to purchase existing tours in bulk quantities at a discount, please use the contact form below. 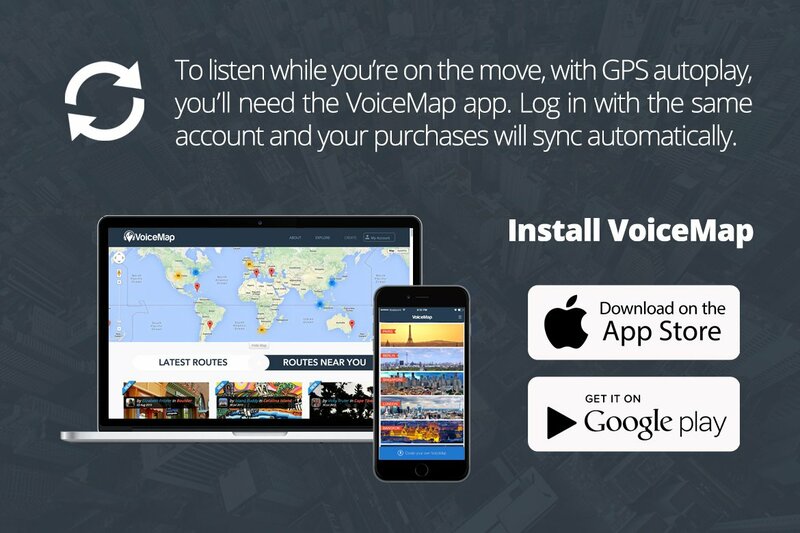 Why are VoiceMap tours right for you? Our partners use VoiceMap to achieve a variety of goals and solve a variety of problems. Our tours connect you to the invisible guest. These are people who use their mobile device to book accommodation, flights, and and entrance tickets. They’re the people who eschew hotels and taxis in favour of Airbnb and Uber. VoiceMap tours allow you to tell your story. In an era of short attention spans that reduce your message to 140 characters or the first five seconds of a video, total engagement over the course of a 45-minute walk is truly exceptional. VoiceMap’s users share. Our tours connect you with your customers on the same mobile device they use for Facebook, Twitter, Instagram and Snapchat. They also frame the perfect photograph and relay that one, must-tell story. VoiceMap tours increase footfall and encourage visitors or guests to linger longer. In a recent UK study, a 1% increase in dwell time was found to correlate with a 1.3% increase in daily sales. Our clients include tourism boards, iconic attractions, estate hotels, and events with hundreds of thousands of guests. We have published audio tours in over 50 cities worldwide, in collaboration with world-famous actors and bestselling authors. A new VoiceMap is released almost every day, and our existing user base includes large, passionate communities who regularly gather for group walks. i Light Marina Bay is Asia’s leading sustainable light art festival. It features a series of interactive light installations, which transform the bay into a kaleidoscopic display of light, colour, shadows and play for people of all ages to enjoy. The i Light Marina Bay 2016 guides allowed visitors to explore the installations at their own pace, with the guidance of a studio produced audio tour. The tours offers insight into the stunning light art installations, including how to interact with them, conceptual explanations and interviews with the artists themselves. Table Mountain is one of the New7Wonders of Nature, and it’s a South African icon. The flat-topped mountain hosts the smallest but richest floral kingdom on earth with more species than can be found in the entire United Kingdom. Its unique flat-topped peaks reach 1,086 m above sea level. The Table Mountain Aerial Cableway Company now offers a GPS-guided Table Mountain Audio Tour, which allows visitors to explore a little more than they would alone. It guides them on a round trip of the top of the mountain. Theatreland is in the West End of London, and it’s home to London’s most prestigious theatres. The stages are regularly graced by some of England’s most famous actors. The Society of London Theatre has launched a Theatreland Tour with Ian McKellen around this historic district. It features his own personal stories about building his career in the West End, and immersive soundscapes that take you right back to Shakespearean London. Sponsor downloads of your tour, making it free. Go HERE to learn more about the first option, intended for independent writers, podcasters, filmmakers and tour guides. Sell your tour for between $0.99 and $9.99. We pay a royalty of 50% after transaction costs. The cost of sponsoring a tour is tiered. This both reduces risk and accommodates partners large and small. Every business we have worked with to date has chosen the first option, for one simple reason: free tours are 5 times more popular than paid tours. The services of a team of expert editors to assist throughout the process of writing and recording the tour. This does not include writing the script, voice artists, or studio time. (We will edit your audio.) For additional fee, described below, VoiceMap can write and record the tour on your behalf. Updates for seasonal differences or changes at locations on the tour. Assistance with marketing efforts for your tour. Reports on the number of downloads your tour has received. What additional services can be included? Many partners are too busy or lack the capacity to create the tours themselves. For a per word rate, we can map, research, and script the tour for you. Our expert editors work with local freelancers, charging local rates, to tell a story that reflects your voice and identity. We can also help you select professional voice artists, coach them on your requirement, and book studio time on your behalf. Some tours include interviews with personalities connected to a place – with artists whose work is displayed on the tour, the CEO of a tourism board, or experts who give an extra dimension to the tour. Fees for these services also reflect local rates.